The San Marco seen from the front. The bell tower (barely visible) is from 1154. 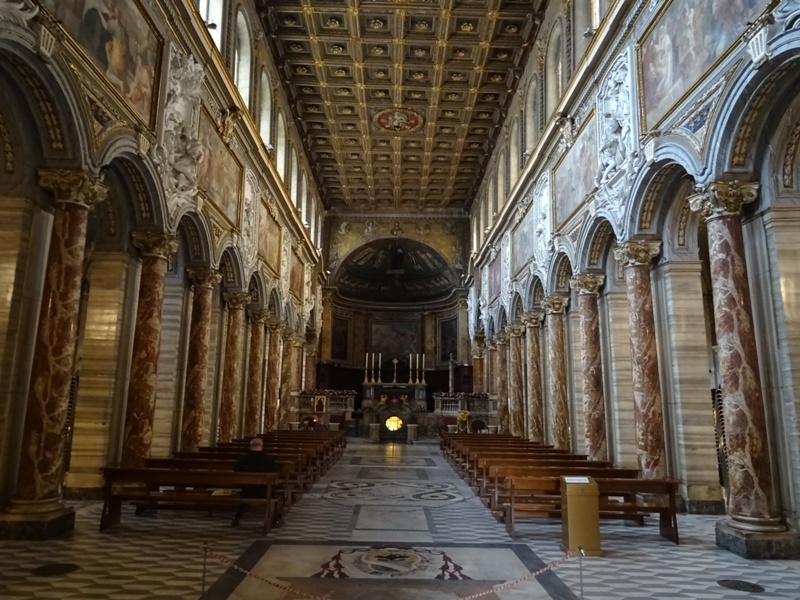 The San Marco may be one of the oldest churches in Rome. Tradition dictates that it was founded in 336 during the reign of pope Marcus. Marcus’ pontificate was quite short: he was pope from 18 January until 7 October. So if he was indeed responsible for the construction of the San Marco, it must have been in 336. Although pope Marcus was canonised and became San Marco, the church is, of course, not dedicated to him, but to Saint Marcus (or Mark) the Evangelist. Hence its full name: San Marco Evangelista al Campidoglio, with Campidoglio being the Capitoline Hill nearby. Pope Marcus took over a house at this spot and converted it into a church. This church was reconstructed many times, with important renovations taking place during the reigns of popes Gregorius IV (827-844) and especially Paulus II (1464-1471). The latter was born in 1417 in Venice as Pietro Barbo. This Venetian was titular cardinal of the church when he began restorations in 1455, continuing the work after he was elected pope nine years later. 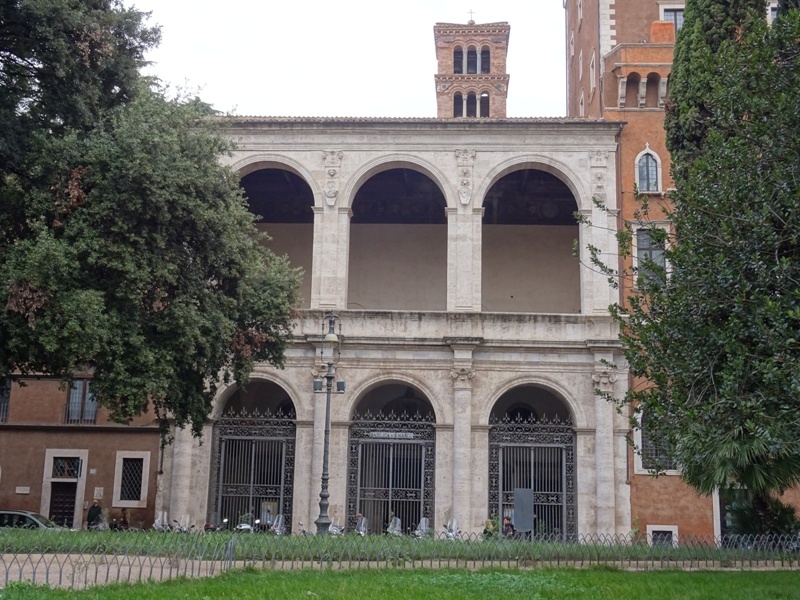 Barbo was responsible for adding the current frontage of the church, but more importantly, he also had the Palazzo Venezia built next door, a palace which almost completely surrounds the San Marco. The church’s interior is mostly Baroque. It is the result of renovations during the seventeenth and eighteenth century. The visitor will notice that behind the row of columns in red and yellow on both sides of the nave is another row of square pillars. The church used to have a Cosmatesque floor, which can be attributed to Barbo’s renovation of the fifteenth century. Only parts of it remain today. The current floor is mostly made of white and dark grey marble. The church has an impressive coffered ceiling. It is made of wood and it is quite spectacular. It may be the oldest remaining wooden ceiling in a Roman church, on par with Santa Maria Maggiore‘s ceiling. 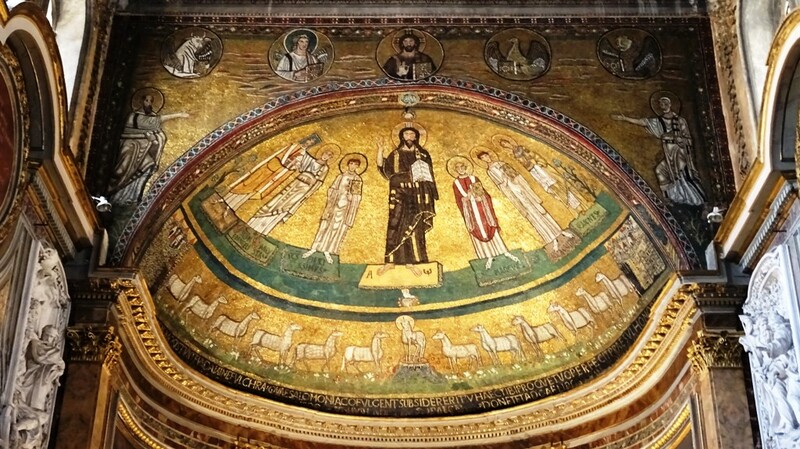 The best part of the church is, in my honest opinion, the Byzantine-style apse mosaic from the ninth century. You pay one euro to switch on the lights. Being surrounded by the Palazzo Venezia, the San Marco is quite dark, so turning on the light is definitely necessary to enjoy the mosaic in full glory. In the conch of the apse, we see Jesus Christ in the centre, dressed in purple-and-gold robes, with the hand of God above him. He is the alpha and the omega. Christ is flanked by three figures on either side of him. On the left, we see (from left to right) pope Gregorius IV, Saint Marcus the Evangelist and the rather obscure Saint Felicissimus (martyred in 258, at least according to Church tradition). Pope Gregorius holds a miniature model of the church in his hands and has a blue nimbus around his head, which indicates that he was alive when the mosaic was made, somewhere between 827 and 844. On the right, we see (from left to right), pope Saint Marcus, the rather obscure Saint Agapitus and Saint Agnes (291-304), the only woman in the scene. In the lower part of the conch, we see the Lamb of Gods flanked by six lambs on either side. On the extreme left and right are the Apostles Paulus (Paul) and Petrus (Peter). 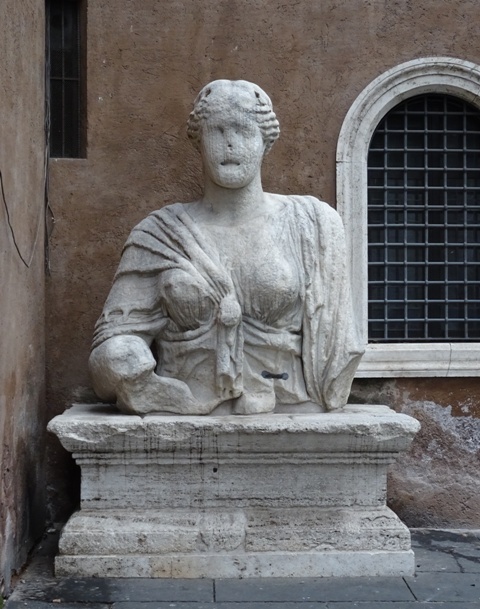 Just outside the San Marco, in a corner to the left, we can find Madama Lucrezia, one of Rome’s six talking statues – the others being Pasquino (the most famous one), Marforio, Abbot Luigi, Il Babuino, and Il Facchino. Lucrezia is the only lady in the company. She seems to have been a statue of the goddess Isis, or perhaps a priestess of Isis, but the fact that the statue’s face is badly weathered makes a definitive identification impossible. Of course, these statues did not really speak: they were used as bulletin boards. Satirical texts and poems were posted on the them by anonymous writers, often levelling criticism at the (papal) authorities. San Marco on Churches of Rome Wiki.